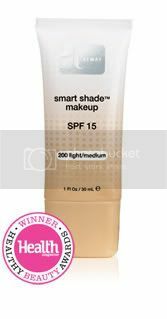 Have you seen the commercial for Almay Smart Shade foundation? When I first saw it I thought I'd had too much chardonnay. Here was Elaine Irwin Mellencamp smoothing on what looked to be plain ol' moisturizer (opaque white), and it mysteriously transformed into a perfect shade of foundation on her face. "This revolutionary colorless foundation contains microscopic color beads that are activated when you smooth it on—transforming into a shade that complements your skin tone. You’ll get sheer coverage with a natural finish, so your skin looks smooth and even." So it seems it's a colorless creamy base with encapsulated pigment; once you apply it to your face the pigment mixes with the cream to form the foundation. This is interesting, but what I don't understand is how this formulation ensures a better match to your skintone. Smart Shade only comes in 3 shades, which is more limited than even the most basic tinted moisturizer offerings from other lines. The pigment in it is already there, and unless it chemically interacts with your skin somehow, I don't see how it has the ability to match every complexion. Worse yet, the darkest shade available is "Medium!" Now do you really expect someone with dark skin to apply this shade and have it "transform" into something complementary to her skin? I haven't tried it myself, but this seems to me to be nothing more than a very fancy, albeit clever, gimmick. Why must we have these microscopic color beads? If you want to buy it for the cool factor - or if you just really like the formulation - fine, but don't expect it to work miracles on your skin.